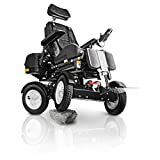 The sturdy, yet flexible chassis, efficient shock absorption & advanced four-wheel-drive form a solid base for smooth movements even on challenging surfaces & areas. The Four X is comprehensively equipped with additional features such as seat tilt, balance adjustment, legrest & armrest adjustments to enable an individual to lead as active a lifestyle as possible. Upgrade to lift or stand support to get an even more tailored experience. Every Chasswheel is manufactured using quality parts & assembled by highly trained experts. It comes with the industries most comprehensive 10 year warranty. Chasswheel produce top of the range all terrain power chairs for individuals who choose an active lifestyle. Its innovative design features 4-wheel suspension & flexible chassis that makes it ideal for challenging terrain. With Chasswheel, going off the beaten track provides an exciting, all round driving experience. It is compact in size & easily manoeuvres in any environment. The four wheel drive packs plenty of power & performance, easily tackling curbs & uneven terrain smoothly & comfortably. Its advanced steering system provides a great deal of agility giving a versatile, smooth drive when manoeuvring in confined spaces. Chasswheel is the ideal choice for smooth manoeuvring in any given environment, whether travelling around town or venturing further afield. Its sturdy design will tackle most terrains unlike conventional wheelchairs.